.Aruba in her own words. These are not my words - the contents found in this blog are Aruban media articles (most of which I have translated from Papiamento to English). As the case has developed, reference is made to Dutch, and occasionally American, media sources. ORANJESTAD -- Patrick van der Eem has arrived in Aruba, where he will tell an American writer his story about the declarations that he elicited from the Holloway-suspect Joran van der Sloot. His Dutch representative Peter Schouten confirmed this to the media yesterday. A book will be published in the US with the story of Van der Eem (34). The title of the book is going to be ‘Disposed’. He already has an agreement with an agent of a publishing company. The first chapter will be published in the American newspaper, the New York Post. Van der Eem will tell how he and his family experienced the undercover operation in the disappearance case of Natalee Holloway. 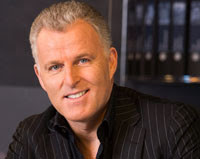 Crime journalist Peter R. de Vries brought the entrepreneur from Almelo, Van de Eem, in as infiltrator to get the truth about the disappearance of the American teenager. According to Schouten, there is big interest for the story in the US. He sees a possible box-office hit with Van der Eem revealing the undercover operation. ORANJESTAD (AAN): In what relates to the appeal by the Public Ministry against the denial of the judge-commissioner on February 1st, 2008 to detain the suspect, Joran van der Sloot in the Natalee Holloway case, the Common Court of Justice of the Dutch Antilles and Aruba arrived to a decision on February 14, 2008 at 5:30 in the afternoon. The Common Court confirmed the judge-commissioner’s decision. To arrive at its decision, the Common Court considered that after taking note of the video and audio materials and also of the partial transcript of these materials, there is currently, in the opinion of the Common Court, insufficient facts and circumstances from which serious objections against Joran van der Sloot for the acts he is being accused of. The Common Court has as a starting point that given the time that has passed and the fact that Joran van der Sloot has already been detained a few times, the question is if serious objections can be said to be the basis to actually place a person under preventive detention again, and the answer is not easily answered in a positive manner. Although Joran van der Sloot in various conversations with Patrick van der Eem made extensive and detailed declarations in what regards to what happened on the night of the disappearance of Natalee Holloway, the Common Court considered various arguments to not take serious objections solely on the basis of these declarations. In so doing, the Common Court considered that Joran van der Sloot gave different contradictory declarations once again, which has resulted in various times that the declarations cannot be confirmed by objective facts. Currently, the parts of the recorded conversations that contain new elements, are not confirmed by objective facts. Considering as well the possible presence of a serious personality problem in the suspect, in combination with the fact that he spoke of things – as he himself said – that do not fit with the truth, The Common Court has sufficient reason to doubt the incriminating character of the declarations. There is no other legal option open to the Public Ministry to appeal the Common Court’s decision. The decision has as a consequence that the Public Ministry cannot detain Joran van der Sloot at this time. The investigation of the Holloway case continues, and Joran van der Sloot remains a suspect. After concluding the investigation, the Public Ministry will take a decision as to the prosecution of Joran van der Sloot. ORANJESTAD – After the Public Prosecutor appealed the decision of the examining magistrate not to detain Joran van der Sloot, the Common Court of Justice of the Neth.Antilles and Aruba announced yesterday evening that Joran van der Sloot will not be arrested again in the Holloway-case. After having examined the possible slanderous image- and sound recording in secret by the editorial office of the Dutch crime journalist Peter R. de Vries, the Court says that there is not enough material to charge him. The Court can in any case not really answer the question whether based on that, the suspect must be taken into preventive custody. The decision also includes the situation that the suspect had given several inconsistent declarations, ‘whereby it also appeared more than once that these declarations could not be objectively confirmed’. What also played a part is the statement of Van der Sloot about having made up everything he had said in De Vries’ programme. The Court does not rule out the fact that the suspect has a ‘serious personality problem’. The OM has no statutory remedies left against the decision. The investigation in the Holloway-case will continue with 25 detectives working on it and Van der Sloot remains the suspect. The OM will decide on further prosecution of Van der Sloot after they are done with the investigation. The police have not told the Aruban authorities that Patrick van der Eem had come forward with the indication that Joran van der Sloot would perhaps talk to him about the Holloway-case. That’s what Justice-minister Ernst Hirsch Ballin told the Lower House on Thursday. Van der Eem, who was used by Peter R. de Vries as informant, reported to the Gelderland-Midden police last fall. The police didn’t work with him, because he made a condition that was against the rules. In connection with the privacy of Van der Eem and the sensitivity of the information, Hirsch Ballin didn’t go into this condition. The police also did not inform the Public Prosecutor. The minister indicated that it is part of the existing work arrangements. Besides, the OM would have most probably not accepted the man’s conditions, said the minister. Column Peter R. DeVries: NO REARREST FOR JORAN: HOW DO YOU EXPLAIN THAT TO HER RELATIVES.....? Joran van der Sloot will not be rearrested for his role in the disappearance of Natalee Holloway, according to a decision handed down by the Court on Aruba last night. This is not altogether surprising, considering an earlier pronouncement by the examining judge that the case is now technically ‘on appeal’, but it is difficult to explain. The main problem is that Dutch law does not provide for detention on remand for disposing of a body. It is indeed an offence which carries a maximum penalty of six months imprisonment, but one can’t be kept in custody pending such a sentence. ORANJESTAD (AAN): Last Thursday night, attorney Joe Tacopina revealed in New York that he received confirmation that the decision taken by the Common Court of Justice of Aruba and Antilles that they rejected the Public Ministry’s appeal for permission to re-detain Joran van der Sloot. The Public Ministry re-opened the investigation on the disappearance of Natalee Holloway due to new details that were secretly recorded of Joran van der Sloot, where he admitted on videotape that Natalee died in his arms. However, apparently the three judges who reviewed the appeal decided that there was nothing ‘new’ that has been brought forward in the recent revelations and in so doing, rejected the appeal. 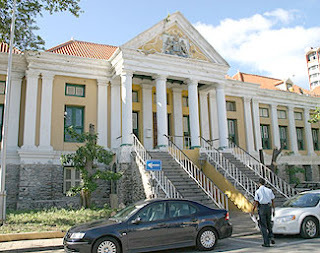 The Courthouse in Willemstad on Curacao, where the Court of Justice is residing. ORANJESTAD – The Public Prosecutor (OM) announced yesterday that the Common Court of Justice of the Neth.Antilles and Aruba won’t decide on a possible arrest of Joran van der Sloot tomorrow, because it was decided that the Dutch lawyer of Van der Sloot gets till Wednesday to give his vision on the case. The examining magistrate decided two weeks ago that the confessions of Van der Sloot that were secretly recorded by Peter R. de Vries, are not enough for arresting him in the Netherlands. The OM that attaches much importance to the statements of the suspect, lodged an objection to the decision. Expectations were that the objection would be honoured or not after last weekend. The OM has till Friday afternoon to submit all relevant information on the suspect. One day before that, on Thursday, Van der Sloot was voluntarily interrogated by detectives of the Aruban police and of the Corps National Police services (KLPD) in Rotterdam, as a result of the recordings. With that interrogation and with supplemental investigation, the OM wanted to gather sufficient evidence to arrest the suspect a third time due to his participation in the Holloway-case. After earlier arrests of the suspect, the examining magistrate is now making very high demands in order to approve the custody. The minister of Justice, Rudy Croes has declared Joran van der Sloot, who is suspected of having murdered Natalee Holloway, persona non grata. Other than for judicial investigation, Joran van der Sloot is no longer welcome on the island. ORANJESTAD (AAN) — The last release that Aruban criminal authorities, the Public Ministry, has released and that came to light yesterday, gave more reason to start thinking whether criminal authorities really know how the justice system works in Aruba. Last week they told the press that they expect the judge’s decision to see if Joran will be re-detained on the basis of the interrogations that took place in Holland. They did not explain that the process will proceed on the basis of rules for a case that has gone into appeal and in which Joran van der Sloot’s attorney’s must be heard, that according to experts to say that he was under the influence of drugs when he made his statements. How can a person under the influence of drugs be heard, authorities demonstrated last year in the case of an addict in Aruba. When the judge handed down the verdict, one of the parties involved appealed the decision. This means that they asked the Court of Justice to hear the case, which has to be treated as any other case. There are accusations and there is a defense. The press release by criminal authorities created the impression that when the interrogation of van der Sloot ended in Holland, the judge was to decide if he’s to be re-detained. It seemed that the judge just had to allow Joran van der Sloot to be detained. In reality, a case in appeal has to be tried again by the Court of Justice and not only with one judge. Criminal authorities present their accusations and the reason for which they believe that the decision of the judge of first instance has to be revoked. The accused has the right to the same defense that he had a right to after the judge’s decision for him to appeal the decision. The information from the Public Ministry took away the legal path from view and created a different impression until yesterday, when criminal authorities again issued a press release to clear up one and another thing and put into perspective the manner in which the justice system functions. Yesterday, criminal authorities – the Public Ministry – announced that contrary to other information, it could not be expected that yesterday, Monday February 11, the court would hand down a decision in its favour in the case that they appealed against the judge commissioner’s decision to refuse the detention of Joran van der Sloot. The court of justice said that they will take a decision after February 13, since the attorney of Joran van der Sloot has until February 13, 2008 to give his point of view in the case that has been appealed. The Public Ministry again concluded in its press release that until the court has decided, it could not give any comment. The question remains if the functioning of the justice system is not known by Aruban criminal authorities, who had problems in proving their accusations against Joran van der Sloot, who they detained on the basis of ‘new information’, who could not prove what Joran, who kept his mouth shut, did. According to experts, it can be expected that Joran van der Sloot’s attorneys will say the same thing that Joran himself has said, that he was under the influence of drugs when he made the statements to de Vries. What does this mean? Could he be held responsible for his words that he spoke under the influence of drugs? Column Peter R. DeVries: What's Joran's parents' case? A few weeks ago, the parents of Joran van der Sloot appeared with me in the Dutch talk show Pauw & Witteman. They asserted that Joran was a boy with a good upbringing, who always treated girls with respect. They also stated that if they had any indication that Joran was indeed involved in the disappearance of Natalee, they would have gone to the police immediately. While he was secretly being recorded in conversation with ‘informant’ Patrick van der Eem, he was under the influence of marihuana, said Joran van der Sloot in the interrogation with Justice. ORANJESTAD -- Joran van der Sloot declared that the conversations in Patrick van der Eem’s car, were carried on under influence of marihuana. He said this at a police station in Rotterdam, where he was voluntarily interrogated yesterday morning. Detectives of the Aruban police and of the Corps national police service (KLPD) and his Dutch lawyer were present at the interrogation that lasted about two hours, said the Public Prosecutor (OM). Other than that, Van der Sloot stuck to all his prior declarations in the investigation. He denies having anything to do with the disappearance of Natalee Holloway, said the OM. He could leave after the interrogation. The examining magistrate decided on February 5 that Joran van der Sloot is not to be detained. The OM has appealed that decision and expects a verdict from the Common Court of Justice. The OM mentioned as an example the media hunt on an accomplice that Van der Sloot mentioned. After this person (Daury Rodriguez) had declared that he has nothing to do with the case, all eyes focused on a next person (Lorenzo van Rijn). If necessary, the OM will also protect the suspect Joran van der Sloot. The OM is also of the opinion that yesterday’s words of Justice-minister Rudy Croes were premature. Croes wants to declare Joran van der Sloot persona non grate. “The boy is not convicted yet; besides, there are a whole lot of judicial hurdles ahead, before he can be refused admission to Aruba. He is legally admitted anyway”, was the reaction of the OM. Many institutions, official bodies, lawyers, journalists, and psychologists are asking themselves how to handle the outpouring of Joran van der Sloot before the hidden camera. According to law psychologist Albert Wagenaar, there is not even a confession in the revealing reportage. There is no solving of the case and it is no confession of a criminal act, ’because none is indicated’, said the psychologist. The ombudsman of NOS, Tom van Bussel is of the opinion that the NOS should have been more reserved in reporting Peter R. de Vries’ claim that he had solved the Holloway disappearance-case. After the coverage of SBS6 on Sunday evening it appeared that De Vries’ promise is not fulfilled. “What we know now is that Joran is a confused guy. Like a source of the OM phrased it: ‘We thought that we would get a solution, but what we got was another of the so-many stories”, states the ombudsman on his NOS-website. At this moment, the Dutch Council for Journalism doesn’t want to say whether certain publications in the Joran van der Sloot-case have crossed the borders of careful journalism. Premier Jan Peter Balkenende assumes that, during his Aruba-visit this Friday, the Holloway-case will come up for discussion in his conversation with Premier Nelson Oduber. He said in the TV-programme EenVandaag that this is the case of the judicial authorities and that he must not get involved. He pointed out the complexity of the case. Van der Sloot’s statements are indeed arguable; Daury said that he was not on Aruba when the affaire took place. Balkenende will be on Aruba and the Netherlands Antilles for five days, starting on Sunday. 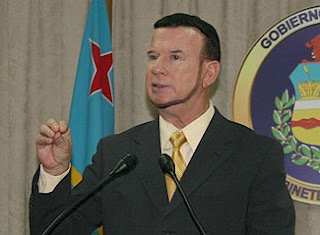 Justice-minister Rudy Croes does no longer want Joran van der Sloot on the island, because he has caused and is still causing a lot of damage to the image of Aruba. ORANJESTAD – The minister of Justice, Rudy Croes has declared Joran van der Sloot, who is suspected of having murdered Natalee Holloway, persona non grata. Other than for judicial investigation, Joran van der Sloot is no longer welcome on the island. All eyes are now focused on the declaration that Joran van der Sloot wants to give to the police. According to his lawyers’ firm in the Netherlands, he hadn’t done that yet yesterday. On no account does the Public Prosecutor (OM) want to say where, when, or if there’s going to be an encounter. The ministry of Justice said that two detectives from Aruba had gone to the Netherlands for this. Also chief prosecutor Hans Mos is in the Netherlands, but supposedly on vacation. Because the suspect has voluntarily committed to give a statement, the OM must passively wait a see whether Van der Sloot will come to the police station. Arresting him is impossible, as long as the examining magistrate in Oranjestad does not give permission for this. The OM had till this afternoon to submit the court of Justice with all relevant information and objections regarding the appeal against the decision that the examining magistrate made last week, not to arrest Joran. The court will decide on this next week. Patrick van der Eem not welcome in the US due to his drugs past. The interest for the Holloway-case remains the same in the United States. Peter R. de Vries, who left for the United States last Wednesday to appear in among others the Larry King show and Good Morning America, receives most of the attention. One of the first things that Larry King wanted to know from De Vries was whether he has questioned the reliability of informant Patrick van der Eem. He has a criminal record and he has drugged Joran van der Sloot to encourage him to confess, said King. “Smoking marihuana is Joran’s daily routine anyway”, answered De Vries, who didn’t think Van der Eem’s past is important. But Justice in the US thought differently and arrested Van der Eem immediately after arrival at JFK-airport in New York. They put him on the very next plane to the Netherlands. Because of his criminal record, Van der Eem was not allowed to enter the US. The idea was that together with De Vries, he would also go on tour to all the big American TV-stations. Also the family Holloway is receiving a lot of attention again from the media in the US. Natalee’s mother Beth Twitty is often seen in the company of Peter R. de Vries. I generally don't ask for much, but if you're going to copy/paste my translations, have some integrity and credit or link me. Basic netiquette.